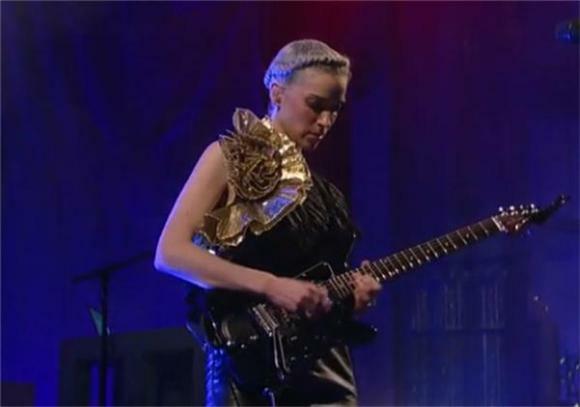 Last night St. Vincent performed an 11-song set at the Ed Sullivan Theater for an episode of the Live on Letterman webcast. Although unusually tame-haired, the animatronic Annie Clark tip-toed on stage for an epic set of songs off her latest, eponymous LP, as well as a few Strange Mercy throwbacks. Watch the entire hour-long performance below, and tune into the Late Show with David Letterman tonight to see St. Vincent bring her creative freak to live TV once again after confusing the country on SNL earlier this year.